This walk: 2013-5-29. 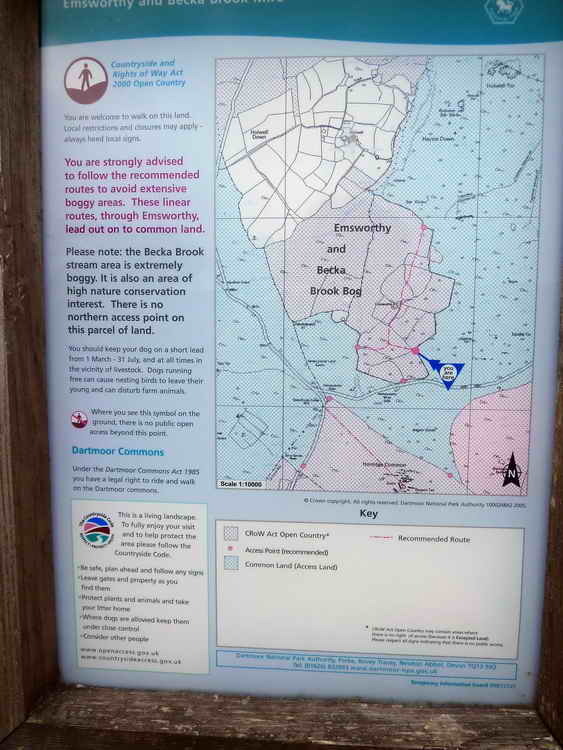 Teign Estuary, Emsworthy, tramway, gorse blossom, Hamel Down, Chinkwell Tor, Honeybag Tor, Hound Tor, Holwell Tor, Saddle Tor, Haytor, leat, Emsworthy Rocks, bluebells, slotted gate posts, alpine cow bell, barn owl box, longhouse, Becka Brook Bog, Emsworthy Mire, hut circle, Baggator and Ilsington boundary stones, Common cotton grass, Fitches Holt, Whortleberry Rock, North Hessary Tor, Greator Rocks, Manaton Church, curlew, cuckoo, Templer granite tramway points, unfinished apple crushers. Link to Google Satellite view of the area - the car park is in the middle of the bottom edge of the image. Emsworthy Farm is a little to the "8 o'clock" position from the centre of the image. This walk was more or less a repeat of the walk done on 4th May 2011. 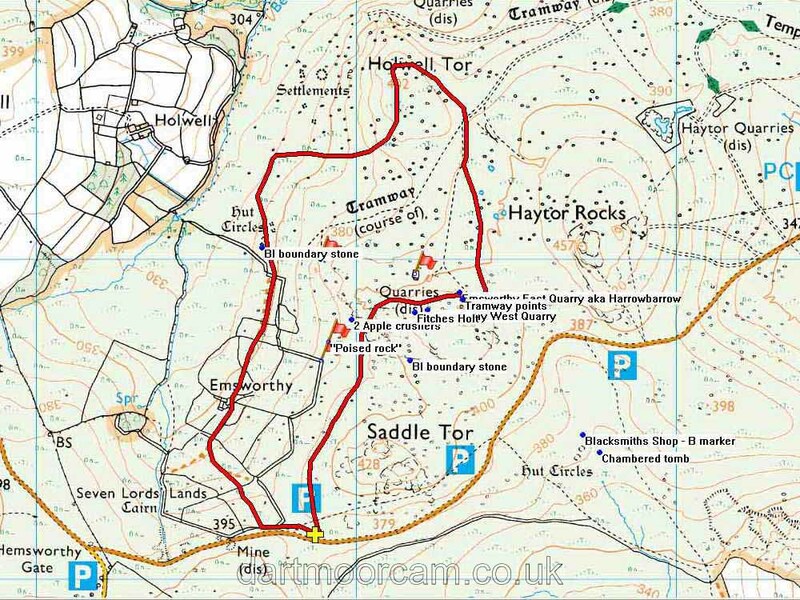 This walk was more or less repeated the following day, 30th May 2013, with e.g. Fitches Holt being definitely identified. View towards Teignmouth and the Teign Estuary. A low-flying RAF Hercules aircraft about to disappear behind a hill - this photograph was more successful than those taken of the curlew and the cuckoo! View of Saddle Tor with Haytor behind. From this angle, Haytor is more towards the left. Gorse blossom in abundance, unlike most of the near-by bushes. It was odd to hear the alpine sound of a cow bell on Dartmoor! It is so common in the Austrian and no doubt other Alps. Emsworthy Farm, first recorded in 1379 as Aylemesworthy and recorded in 1560 as Omsworthye, was believed to be last lived in during the 1870s; it formed part of Bagtor Manor (source: Hemery, page 733). Click the image to see a larger version. Looking up at Emsworthy Rocks. Looking down over Becka Brook Bog / Emsworthy Mire. The reverse side bears a "crossed I" for Ilsington Manor. Looking back at the entrance posts - these are referred to as the "Two Stone Posts" boundary marker in old manorial records. Source: Dave Brewer (2002) Dartmoor Boundary Markers, Halsgrove, p. 98. Enlargement of the photograph suggests that there are several seed heads and that this is therefore Common cotton grass, Eriophorum angustifolium, rather than Hare's tail cotton grass, Eriophorum vaginatum, that has a single seed head. View to the area believed to be Fitches Holt. According to Hemery (page 735), this is the site where polecats once bred ("fitch" being an old name for polecat) ...... "A smaller detached pile below the main summit", talking of the south end of Emsworthy Rocks. Another pile nearby is known as Whortleberry Rock. Looking at bluebells across the valley. Why did I take this? Interesting layering in the granite. Holwell Tor conquered, SX 7512 7761, elevation 402 metres (1318 feet). Hound Tor (left) and Greator Rocks. St. Winifred's Church at Manaton. Somewhere over there, is a curlew, hiding! It transpired that there were two, neither of which appeared in photographs. I mentioned my nights out on the Hayle Estuary as a teenager, tape-recording waders and on adjacent fields that belonged to our family. After the Hayle bypass went through and carved up the farm, some of the land became a bird reserve: RSPB Ryan's Field (map), RSPB site guide (incl. Ryan's Field). Looking down into the disused Emsworthy East Quarry aka Harrowbeer Quarry. Another zoomed view across the Becka Brook valley at the Holwell bluebells. There is a cuckoo in that tree: it flew in, I took the photograph, and then it flew out, calling. They said it was in the right side. Rusty-backed sheep, a new Dartmoor breed? A view of part of Saddle Tor. "Ere, boy, you put that one in over there!" Red = GPS satellite track of the walk. The track below is a close approximation to where the walk went today - unfortunately I deleted the day's track before I saved it! This walk was approached via the A38 from Plymouth, Newton Abbot/Widecombe turn-off and following the road for Widecombe to Hemsworthy Gate where we turned right, towards Bovey Tracy, and stopping at the first car park on the left, the P symbol with a yellow cross on the map. Distance - 4.12 km / 2.56 miles.